Alejandro Santiago was born on April 22, 1964 in Teococuilco de Marcos Perez, a small rural town in Oaxaca with a large population of Zapotec indians. 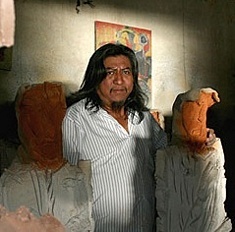 He moved to the city of Oaxaca at age 9 where he studied painting and sculpture. For his hard work he was given a scholarship to work in the US and Europe for 10 years. It was during this time that his noteriety became intenational since he was featured prominently in several exhibitions in Paris, Brussels, San Francisco and other important cities. He died on July 22, 2013 victim of a heart attack.